[email protected] is a community-based chronic illness rehabilitation service whose Move-On programme is geared towards individuals that have completed their cancer treatment. The classes, held at WIT Arena by qualified fitness instructor Anna Hawrylak, are held in a group environment but the exercises are adapted to the participants’ level, initially working on their basic movements, before building their basic strength and cardiovascular fitness. 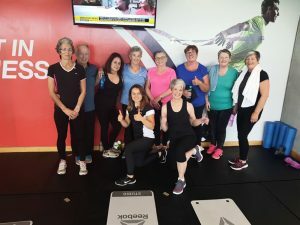 Not only does it help eradicate cancer-related fatigue, it improves people’s physical fitness, sleep, quality of life, aerobic fitness, strength and mobility, with one participant Sheila Norris of Dungarvan saying affirmatively that it has given her her life back. The programme grew from a research study conducted by Patricia Sheehan from Dungarvan, a recipient of the WIT President’s PhD Scholarship. Her study demonstrated that cancer-related fatigue improves considerably following a 10 week exercise intervention in individuals with moderate to severe fatigue at baseline. This exercise effect is greater than that achievable with a non-exercise health education intervention. The fact that the sessions do not take place in the hospital environment helps and, importantly, it is a fantastic way to meet people who share your experience without dwelling on it. Ultimately however, the participants are the best people to speak of its worth. Anne Marie Phelan from Waterford and Slieverue woman Breda Kenneally have integrated into non-MedEx classes afterwards and they credit it for allowing them to do things they weren’t able to do post-treatment others took for granted.